This section aims to identify and present published writings by individuals of Gagliatese origin or extraction and published writings about Gagliato. If you know of any authors or publications, please submit the relevant details by completing the contact form at the bottom of this page. Below are details of some of the published works of Domenico Vitale (poet), Francesco Pitaro (journalist/writer), Vincenzo Pitaro (journalist/writer), and Francesco Armogida (writer). Excerpts of these works along with the works of others, including Laura De Luca (broadcaster/journalist/writer) will be presensented in the near future. Un giornale mensile (supplemento della testata giornalistica L’altra Calabria interamente dedicato a Gagliato e ai Gagliatesi sparsi nel mondo. Viene diffuso perlopiù nel periodo estivo, quando Gagliato si popola maggiormente. È una simpatica e libera voce della carta stampata che tratta argomenti di natura socio-politica, amministrativa ma anche tematiche culturali, tradizioni, ecc., anche se non manca la satira pungente, a volte stimolante, a volte fustigatrice dei mali sociali, di tutto il peggio che accade in questo nostro bel paese, impedendone il decollo. A dirigerlo è il giornalista e scrittore Vincenzo Pitaro. La diffusione è gratuita. This free tabloid is distributed as a supplement in the “L’altra Calabria” newspaper during the summer months and is edited by journalist/writer Vincenzo Pitaro. It presents to readers a variety of articles focused on current issues and how they affect Gagliato and its people. Professionally written and not devoid of wit and humour. 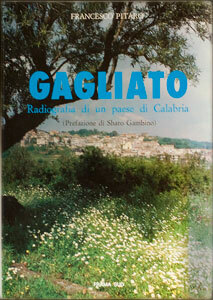 This softcover book was presented by its author, Francesco Pitaro, to the town of Gagliato back in July of 1989. It is a well researched book that has been quoted in most writings about Gagliato ever since. The book is written in Italian (197 pages). Copies of the book may still be found in Gagliato at Bar Apollinaro. This softcover book appears to have been presented by its author, Francesco Armogida, to the town of Gagliato sometime in June or July of 2007. It offers historical, political, geographic and cultural tidbits about Gagliato. The book is written in Italian (110 pages). Copies of the book may be purchased in Gagliato at Bar Apollinaro and in Toronto through Gagliato Club. This softcover release contains the famous local poem “Ì ZZìppuli” by the late Domenico Vitale. Printing was completed on May 1st, 1964 and it appears that the book is no longer in circulation. Rich with folklore and tradition, often cited and recited by the older generations. The book is written in Gagliatese dialect with Italian subtitles (44 pages). A recent softcover poetry release by Vincenzo Ammirà, published and edited by Vincenzo Pitaro. One in a series dedicated to the Calabrese dialects and traditions. Details not available at this time. A recent softcover release by Vincenzo Pitaro dealing with an area near Gagliato called Petrammacàri (rough translation — “cherished stones”). Details not available at this time. A recent softcover release by Vincenzo Pitaro dealing with Gagliatese folklore. Details not available at this time.